The brig Elizabeth Watts sailed for England in late 1861 carrying 224 tons of a substance called petroleum. Not much is known about the Elizabeth Watts. She carried the world's first really substantial cargo of oil and arrived safely in England 45 days later. Beyond that the records are blank-except to note that the ship's master had considerable difficulty in recruiting a crew. The tanker industry was 120 years old in 2006 and both the fleet and the volume of oil transported worldwide by these highly specialized vessels have grown dramatically since the first tanker set sail in 1886. The increase in size of the cargo ship during the second half of the 19th Century was not as spectacular as the growth of the passenger liner - but grew and specialize they did. The 2700-ton GLUCKAUF, built in Britain, became the world's first true oil tanker, with separate tanks for the oil built into her hull. Ironically, Gluckauf means "lucky" in German, but then all ships eventually come to an end. Her career was short lived. On March 25, 1893 she ran aground on Fire Island, New York and could not be refloated. The remains of her hull can still be seen, just off what is a popular fishing beach. The tank steamship, for carrying oil in bulk, was an American invention. Shipbuilders declared for years that no vessel with a shifting cargo, like oil in bulk, would live through a gale, but an enterprising Yankee demonstrated the fact that petroleum could be pumped from the pipe line directly into the hold of a steamship and transported across the ocean in safety. The cost of barrelling the oil is saved, and there was also considerable economy in loading. 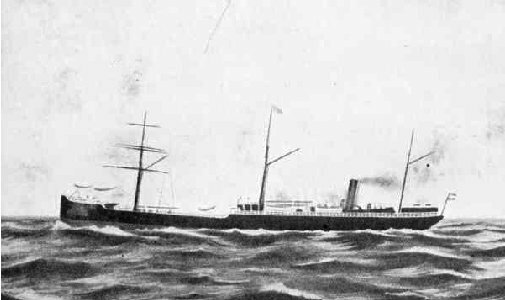 The tank steamship of 1890 could always be distinguished by her odd appearance, the funnel being placed a little forward of the mizzenmast. She has two decks; the hold is divided into from 7 to 9 compartments or tanks for oil; each tank has a capacity of about 4,000 barrels. An empty space of about two feet, called a safety well, is forward of the boilers and engines, separating them from the cargo hold. This empty space, which has a bulkhead on each side, is sometimes filled with water. The depth of the tanks or hold of the typical tank steamship of 1890 was about 24 feet. On the top of these tanks are expansion tanks, about 5 feet square, reaching to the upper deck, and provided with hatches. The tanks are filled quite full, but sufficient sphce is left unfilled in the expansion tanks to allow for the expansion of the oil, which is one per cent in volume for every 20 degrees Fahrenheit. The tanks are filled by means of a very powerful pump, situated at varying distances, from a few yards to one-eighth of a mile from the ship. The greatest care is taken in loading the vessel. A man with a flag is stationed on the ships deck, and another man with a flag is placed at the tank. The signal to start and to stop pumping is passed from one to the other. The largest vessel can be filled in about 12 hours. The balance of space between decks is used for storing coal, the ships fuel. When the cargo is discharged in Europe the tanks are filled with water ballast for the return trip. Some of these 1890 steamships had been very lucky in picking up disabled passenger steamships, which, of course, meant a substantial salvage. There were about 70 of these tank steamships in the trade by 1891, the majority of which were employed by the Standard Oil Company and their connections, and new ones are being constantly added to meet the increasing trade. They were all under foreign flags. English, German, and Dutchbut the Standard Oil Company owned a large interest in them. 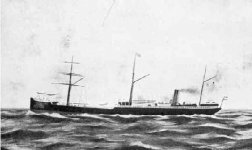 These 1890 steamships were all supplied with triple expansion engines, and were capable of maintaining a speed of from 8 to 11 knots per hour on the small coal consumption of about 25 tons for each 24 hours. As of 1891 the Bayonne was the fastest; she made the trip from England to New York in 11 days, averaging 11.10 knots per hour. They averaged from 2,000 to 3,000 tons gross, and carried from 3,000 to 4,000 tons of cargo. Aft of the engine-room is the cabin and officers quarters, which are comfortable in every particular. The crew is located in the forecastle, as is usual on all vessels. The crew number about 30, all told. The tanker industry saw significant technological advancements since 1890. Vessels have increased dramatically in size and carrying capacity and they have progressed from coal-fired engines via steam-turbines to diesel engines. Demand for oil was encouraged by the invention in 1897 of the Diesel engine, which used oil as a fuel rather than coal. Within a few years, marine diesel engines were being built-in and by 1911, the first diesel powered ship crossed the Atlantic. By 1927 some 28% of the world merchant fleet used oil for power. During the next few decades, oil replaced coal as a source of energy and tankers soon formed a major portion of the world fleet. Until 1950, however, most of them were designed to carry petroleum and other refined products. Refineries were generally located close to the fields where crude oil was found. But political and technical developments encouraged the oil industry to move their refineries closer to the markets and this led to an increase in demand for tankers designed to carry crude oil rather than refined products. In 1950 the standard sized oil tanker was the "T2" tanker, some 620 of which were built in the United States between 1942 and 1946. The tanker equivalent of the famous Liberty ship, many T2 ships were sold after the end of hostilities and formed the backbone of many fleets. They had a deadweight of 16,000 tons and many were still being used in the 1960s. By the middle of of the 20th Century, with the oil boom growing in order to keep up with soaring motor car production, a tanker of around 25,000 ton was a big one. With the main oil producers concentrated in the Middle East and the main consumers being concentrated in the West, the overall size of tankers was generally limited by the maximum that could use the Suez Canal, about 30,000 tons gross. The maximum size of tankers changed after two periods of closure of the Suez Canal - the first in 1956 after the Suez Crisis and the second in 1967 after the Six Day Way between Israel and Egypt. After the Canal was closed, oil brought from the Middle East to the West had to be carried by the longer route around South Africa. As a result, tanker sizes began to grow significantly, a process that was to continue until the end of the 1960s. In 1959 the 114,356 dwt Universe Apollo became the first tanker to pass the 100,000-ton figure: within a decade ships five times that size were being planned. Thus a new generation of tanker was born, the VLCCs (Very Large Crude Carriers) and the ULCCs (Ultra Large Crude Carriers). Other innovations, including safe tank venting, inert gas systems, crude oil washing, sophisticated engine room control systems and satellite navigation all have had a significant impact on the safety and efficiency of tanker operations. One of the most significant innovations in recent years has been the double hull design, which became mandatory from the early 1990s. International regulations will lead to the phase-out of single hull tankers within the next 10 years.